It's that time of year. The temperature is cooling down. The holiday conversations are heating up. And the kids have all gone back to school. Well, almost all of the kids. Tonight, on the season premiere of The Middle, Axl Heck is actually finally heading off on his big college adventure. Of course, in true The Middle fashion it wouldn't be a road trip if the whole Heck family didn't tag along. Needless to say that's sure to cause a whole lot of trouble. 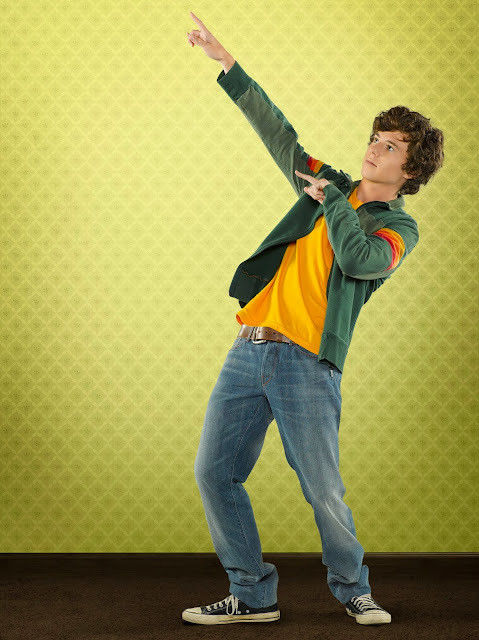 In a recent interview, the man behind Axl, Charlie McDermott, confirmed that wackiness will ensue on the opener. According to Charlie, "Axl wants just his dad to bring him to college, drop him off and leave him there but it becomes a family event. The road to college is plagued with lots of detours by Sue, which drives him nuts." But it seems that Axl isn't going to be able to blame all of his troubles on his younger sister. The hippest Heck isn't necessarily going to be the big man on campus according to Charlie. As he explained, "Axl arrives to a very cold, unfriendly roommate. He's optimistic at first but that optimism quickly changes and becomes a slight panic when he realizes that his cool from high school has worn off and has no effect on this new land he's encountering." That might mean viewers will see a slightly different side of Axl when he moves out of his family home. Although Charlie admitted his character hasn't evolved much throughout the run of the series, he added, "Maybe this season he's going to change a bit but I he's still over-confident to the point where it works for him. And I think he always will be that way. I think it will always work." That's good news for Charlie who confessed that Axl's unabashed self-assurance makes him a pleasure to bring to the small screen. "He's a fun character to play because you can kind of get away with anything," noted Charlie. "He's kind of this terrible person that somehow gets away with it all of the time. It's fun to berate people and be allowed to do it." So much fun, in fact, that it seems his TV persona has rubbed off a little bit on the actor in real life. Charlie revealed, "Over the past five years, some of Axl's slipped into my life. A little bit… especially because my sister lives with me now. She lives in my apartment. So sometimes I'll be loud and I'll be just doing Axl occasionally and then realize what I'm doing and I'll stop it. It's bled into my life a tiny bit. Only in private though, I don't go out acting like him. But with my sister I'll sometimes Sue her up." Fans might be surprised to learn that Charlie probably "Sue's up" his sister more than he does the actress who plays Sue, Eden Sher. According to Charlie, "Eden's one of my closest friends. We're pretty close on and off set. I was at her place yesterday after the table read and we were looking at some photos from the past couple of years. It was bizarre to see. She's really fun to work with… And it's fun to get to go in and pretend to hate each other for the majority of the day and then go hang out and not hate each other." But he conceded that occasionally their TV show dynamic crosses over. "Sometimes it will bleed over to real life," noted Charlie. "She'll do something stupid and I'll rip on her for it. But it's all in jest. It's not real like it is for Axl and Sue." Watch Axl and Sue go head-to-head on the season premiere of The Middle tonight at 8 p.m. EST/7 p.m. Central on ABC. And stay tuned for details on Charlie's feature directorial debut “ImagiGary"— a film that he wrote, helmed and starred in which is due to hit festivals next winter.